The year 2011 has been an extraordinary year for Tunisia – a historic year that will be engraved into the memory of every Tunisian. What started as a spontaneous act of despair in the forgotten and marginalised region of Sidi Bouzid, turned into a popular uprising that would sweep the country, topple the 23-year rule of Zeine el Abidine Ben Ali, and change the face of the entire region as one Arab country after the other picked up the revolution fervour. 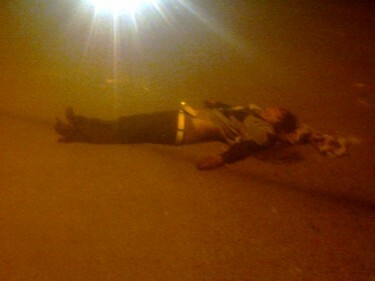 Dead young Tunisian man in Tala (central-west of Tunisia), January 10, 2011. 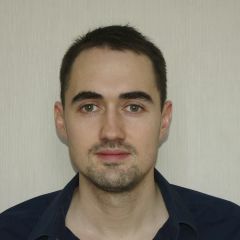 Photo from Nawaat. The year had a bloody and violent beginning. Authorities responded to the protesters’ demands of “employment, freedom, and national dignity” with live bullets, and tear gas, killing more than 300 protesters and injuring many more. Photo by Talel Nacer, copyright Demotix (14/01/2011). 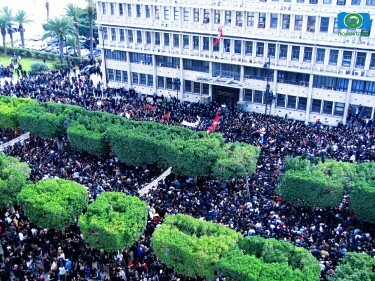 On January 14, 2011, thousands of protesters gathered outside the building of the Interior Ministry in the capital Tunis. The protesters were chanting ”Interior Ministry is a Terrorist Ministry”, and ”Ben Ali Dégage” (Ben Ali Get Out). The demonstration which started peaceful, ended up with police violently dispersing protesters. Later on the same day, Ben Ali fled to Jeddah, Saudi Arabia. 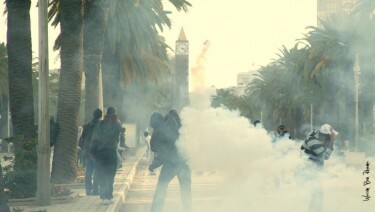 Police use tear gas to disperse protesters outside the Interior Ministry on January 14. 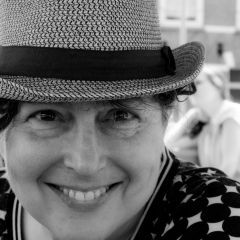 Photo by Wassim Ben Rhouma via Flickr (CC BY-NC-ND 2.0). 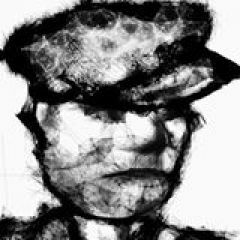 The dictator is gone, but what about dictatorship? Protest against interim government presided by Mohamed Ghannouchi, a close ally of Ben Ali, on February 25. One day later, Ghannouchi resigned. Photo by Kahled Nciri. Tunisians were keen to cut all ties with the past, and the battle for democracy in Tunisia, did not stop with Ben Ali fleeing the country. Kasbah square, where the Cabinet building is located, became an epicenter of sit-ins and protests, which sought to overthrow the so hated former ruling party (now dissolved), the RCD (from its French acronym Le Rassemblement Constitutionnel Démocratique, Constitutional Democratic Rally in English), which was associated with corruption and oppression. Voters lining up to vote. 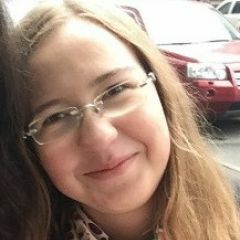 Photo by Erik (@kefteji). 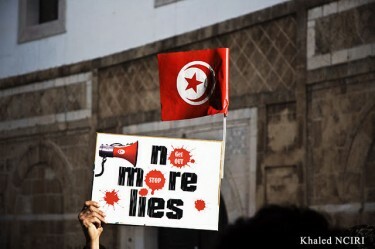 October 23, 2011, was a turning point for Tunisia. 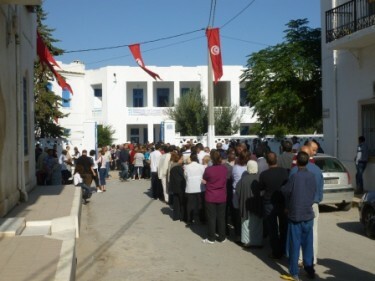 Voters waited for hours to elect their representatives, in the first free and fair election of the so called Arab Spring. 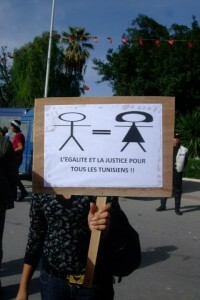 Banner reads: "Equality and justice for all Tunisians". November 21, 2011, in a protest outside the assembly. Photo by Soukaina W Ajbetni Rouhi via Facebook. The Islamist party Ennahdha won 41 per cent of the votes, and gained 89 out of 217 seats at the constituent assembly. 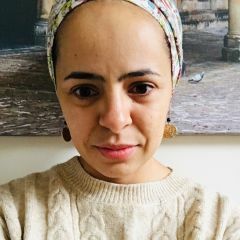 For liberals, the rise of Islamists in Tunisia, is a threat to the secular values of the state, and Tunisian women's rights, considered as the most advanced in the Arab region. 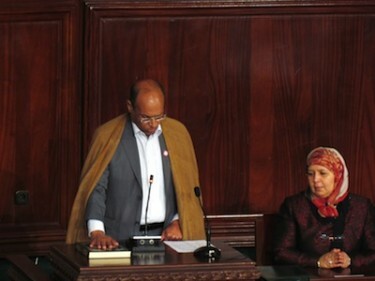 On December 12, the national constituent assembly elected human rights activist Moncef Marzouki, who was imprisoned, and exiled under Ben Ali’ regime, as the new President of the Republic of Tunisia. As the year comes to an end, protests and sit-ins for democracy, employment, and dignity continue in Tunisia, as heated debates sweep the national constituent assembly, and an interim government presided by Hamadi Jebali (from Ennahdha) takes up duties. Stay tuned for more Tunisia coverage in 2012.